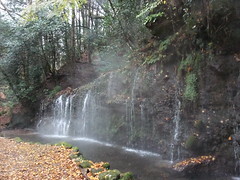 I like waterfalls, so I went to check out one called Chisuji Falls. 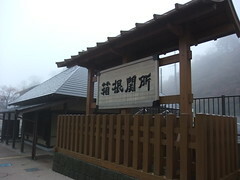 Then I headed to Hakone Sekisho Ato, the reconstructed site of the Hakone checkpoint. 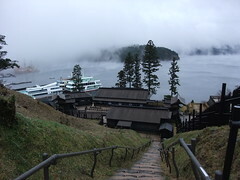 It was freezing cold (it was around 9am in the morning) so I was the only one there. The water on the trees were frozen. 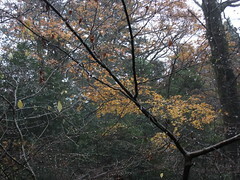 but it was too cold, wet, and slippery so I had to give that up. 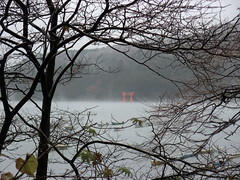 I did get a nice, foggy view of the Hakone Shrine torii gate though. 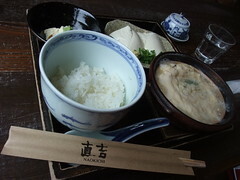 For lunch I had the yuba bowl at Naokichi. I bought souvenirs and left a little after lunchtime to beat the crowds. 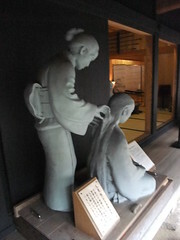 I think I worked on deadlines when I got back to Tokyo. copyright © 2005 One Potato Two all rights reserved. Powered by FC2 Blog./ kero-ru character design by sakura-hiro. I am a translator & interpreter in the entertainment industry. I do both English to Japanese and Japanese to English. Some of the stuff I translate include movies, manga, anime, video games, and etc. For a list of what I've worked on, please look here.